For somebody who was to become one of the central figures in 1980s mainstream rock, Bryan Adams had a relatively inauspicious beginning. His father, Conrad Adams, and his mother Jane, emigrated to Canada from England in the 1950s. Like his own father James, Conrad attended the Royal Military Academy at Sandhurst, but while James fought in both world wars, Conrad was born too late to see wartime service. He had been a soldier for Britain and then for Canada, and in keeping with his vocation went on to become a military diplomat. Jane fell pregnant in 1959, and one day that winter, while Conrad was away in Malaya, she tenaciously walked 2 kilometres to a hospital in Kingston, Ontario, where she gave birth to a boy. Since he was born on the 5th of November, it was decided his middle name would be Guy. Bryan Guy Adams and his younger brother Bruce had an unusual upbringing. Their father’s middle level job in the Canadian Diplomatic Corps meant that the family moved at least once every three years and they had to make new friends in each new place they settled: England, Portugal, Austria, and ultimately Canada once again. In England young Bryan was sent to a military boarding school. He liked to play soccer but was rather belligerent at times. The young upstart occasionally got suspended, and once was even expelled. Such tales might suggest that he was some kind of junior ring leader, but in fact there was another side to the youngster. Tension between his parents made things uneasy at home and probably helped to add an air of shyness and a penchant for truancy to his defiant young persona. Adams’ parents split up when he was twelve, and it seems likely that this could have affected the boy’s self-esteem; he had no substantial contact with his father again for the next nine years. Once Bryan became famous, The Sun newspaper ran a story based on their discovery of Adams’ parents’ divorce papers in Ottawa. They claimed that Conrad had physically beaten his family, and because Bryan’ s headmaster at the American School he attended in Tel Aviv noticed something was wrong with the boy, young Bryan had been sent to see a psychotherapist. The extent to which these insinuations were true is not as relevant here as the fact that they actually bolstered the Adams legend as a budding rebel – a moody kid firmly in the James Dean category – who found a way to channel his angst in rock music, the play world into which he could escape. Perhaps it would be closer to the truth to consider the flip side of the situation. 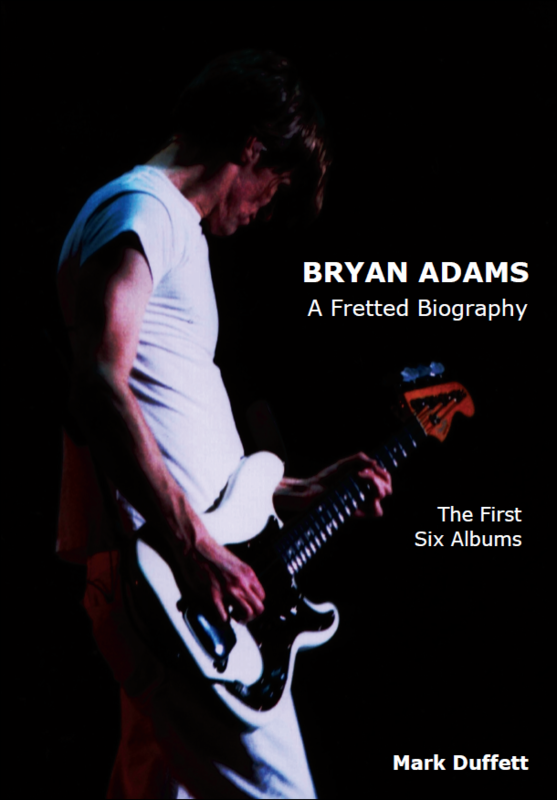 Bryan Adams was a supposedly shy kid, but one who really liked music, especially The Beatles. His parents had bought him drums and an acoustic guitar while his age was still in single figures. Bryan picked up an imitation Fender Stratocaster when he was just 10 and by the time of the mid-1990s he’d been playing electric guitar for over twenty years. That early start was itself a testament to his enthusiasm. If many musicians are simply people with dreams of fame and fortune, the way that Adams taught himself guitar, vocals and soon enough piano suggest those dreams were central to his young life. Similarly, stage performance is a way to be someone else and to please a group of people; Bryan formed his first band, Baker and Lawyer, while he was still at school. Since Adams has spent so much of his life on the road since then, those years were really his formative time. In about 1974, at the age of fifteen, Bryan moved with his mother and brother to Vancouver, on the mild, wet, west coast of British Columbia. The beautiful city sprawls around English Bay and the family established themselves on its north shore in West Van’, where Bryan attended the Argyle Secondary School. Although he washed dishes at the Tomahawk Restaurant for $2.50 an hour, young Mr. Adams’ main effort was put into auditioning for local bands. One was being put together by Dave Taylor, a young Jimi Hendrix freak from the North Shore. At the time Taylor dismissed the pimply kid who stormed in and hammered out a few basic guitar chords as an unsuitable, an insignificant wannabe. Nevertheless the boy from West Vancouver kept trying. He quit school to play in a group called Shock, and used the $2000 fund that his parents had saved for his college education to buy a second-hand Estey grand piano upon which to tinker. At one stage, he even sold pet food to make ends meet. He got into sounds as diverse as Creedence Clearwater Revival and Deep Purple, and attended gigs by Led Zepplin, T-Rex and Elton John. Adams was bent on finding the magic ingredients that made those bands so popular, and he kept up his attempts to make connections as well. Once, to no avail, he tried to get backstage to speak with Tina Turner when she came to town. When Sweeny Todd folded (perhaps under the onslaught of punk and disco, as they were neither) Adams returned to school temporarily. At Long & McQuade music store on 4th Avenue – a street which had been a centre for hippy culture a few years earlier – he struck up a friendship with a quiet man named Jim Vallance. Vallance was a twenty five year old local musician, born in Chilliwack, who learned to play piano from the age of seven, and completed a degree in classical cello down the road at the University of British Columbia. Since then, he had done various musical jobs. At one time he had been active in the Vancouver jingle industry, at another an apprentice sound engineer. He had also filled in as a session performer. By 1975 Vallance had gravitated to pop and joined the group Prism, which was managed by industry entrepreneur Bruce Allen. Prism also included Bruce Fairbairn. When Allen decided that it was uneconomic to take their horn section on tour, Fairbairn found he had a talent behind the production console. Meanwhile Vallance played drums and went by the name of Rodney Higgs in case his old pals from the UBC music department spotted him in the band. After two years Jim left Prism because he never enjoyed the pressure of public performance. The band kept going without him and stayed on friendly terms, but now the multi-talented instrumentalist was looking for a new singer with whom to form a partnership. An enthusiastic eighteen year old Bryan Adams seemed to fit the bill perfectly. Since they are a way to convey private feelings in public places, songs can be sharp, double-edged swords for their makers. There is an element of prostitution in singing your heart out to anyone who will pay to listen, but at the same time being able to share feelings that connect with other people can be an exhilarating experience. Extrovert musicians may have an urge to communicate, but when they do many are aware of the weight of public expectation upon them. Although the new pair originally considered the name Adams and Vallance, Jim opted to be the silent partner. For Vallance, the older and more reticent member of the pair, the songs were the important thing. He constructed a small studio in his downtown home as a laboratory to create them. Vallance felt more comfortable as just a writer. He would get his rewards from that area alone without the trouble of performing and potential difficulties of being recognized offstage wherever he went. There was, consequently, little chance of an ego dispute between the two men: only one of them wanted the spotlight. The symbiotic relationship between Vallance and Adams not only had the potential to work smoothly, but to stand the test of time. As they soon found out, the two men worked well in combination. Both had schooled themselves thoroughly in the mechanics of rock and together they particularly admired the work of Lennon and McCartney. Vallance was a dynamic keyboard player, excellent arranger and could stretch his talent to playing other instruments. He took the bass while Adams jammed on guitar. They knew they had something cooking. The dynamic duo was so very enthusiastic that, in fact, they stopped a pedestrian in the street to road-test a tape of their first song! Then, in 1978, within a year of first teaming up, Adams found a publishing deal. After being rejected by a dozen record companies, Irving-Almo (the publishing arm of A&M Canada) offered him the token sum of $1 in return for the right to shop his songs to any interested singers and take a cut of half the resulting royalties. Desperate to break to the next level, Bryan said yes to the offer. About this time Adams began banging on the door of a music entrepreneur named Bruce Allen, a man who had already become a key behind-the-scenes figure in the North West rock industry. Born in 1945, Allen had begun his career in band management in the 1960s. By managing an R’n’B band called Five Man Cargo he rose to prominence in a thriving local scene. Driven towards even greater things, his ambition was to take a band beyond the Vancouver area, and he eventually got that chance with Bachman-Turner-Overdrive (BTO). In the late 1960s, the Canadian music scene remained embryonic. Local radio stations would play bands from the US in preference to domestic outfits, because American acts had hits proven on a much larger scale. To compound the problem, major labels then avoided bands which couldn’t get significant airplay on the radio, since they would not be profitable. Frequently bands that were ignored at home would overflow down into the USA and continue their struggle to be heard. Many had to wait until changes to local radio regulations encouraged their songs to be played on the air at home, but such changes did not begin until the l970s. However, beginning in 1968, a Canadian band called The Guess Who managed to break the US charts with hit after hit, and in consequence redefined the perceived level of success that Canadian acts were thought capable of attaining. The Guess Who’s songwriters were singer Burton Cummings and guitarist Randy Bachman. In effect that pair were the forebears of the likes of Bryan Adams. After all, the group dressed informally, had unprecedented hits in the USA, and got criticized as derivative bubble-gum makers because their music particularly demonstrated its mainstream influences. Although Burton Cummings had an extraordinary voice, the man who carried the golden thread of Canadian rock forwards from this band was its barnstorming guitarist, Randy Bachman. Cummings and Bachman did not always see eye to eye. Burton the singer was a sloppy rocker dedicated to his lifestyle of the road, while Randy was a moralist and family man. As the two climbed the ladder of fame and wealth with classics like ‘American Woman’ the tensions grew between them and in May 1970 Bachman left the band. That same year Bruce Allen began a talent and booking agency with his Jewish business partner Sam Feldman. With Bachman gone, Cummings and the remainder of his band enlisted a new guitarist and bounced back with an excellent Beatlesque pop platter called ‘Share The Land’. Over the next few years less success in the singles charts conspired with their wild habits on tour to engineer their demise. After that, The Guess Who’s irrepressible lead singer attempted an unimpressive solo career. Meanwhile, following a spell hibernating in Winnipeg, Randy Bachman returned to the spotlight with a country rock trio which he named Brave Belt. Randy’s younger brother Rob played the drums and after one largely-ignored LP, they earned a modest living by touring their native country. Brave Belt ended up in Vancouver, under the management of Bruce Allen, where they received rejections from all the majors before being favourably reconsidered by the Mercury label. Another member of the Bachman family, Tim, was enlisted on rhythm guitar and after that the group changed their name to Bachman-Turner-Overdrive in honour of their bass playing vocalist Fred Turner. With a new label and more populist approach, BTO was re-invigorated. They were looking for stardom. BTO’s first album was a minor hit, selling about 235,000 units across North America. Since their singles made AM radio playlists, they generated enough momentum for Mercury to ship 100,000 copies of their next LP to eager retailers before its release date. By 1974 BTO were really hitting the big time: they had several chart singles, the best two of which were ‘You Ain’t Seen Nothing Yet’ and ‘Taking Care of Business.’ And Mr. Bachman was certainly taking care of it. As a writer he may have been one of rock’s best minimalists, but as a musician he was a commercial opportunist of the highest calibre. Randy was even churning out plodding rock tunes that he didn’t particularly care for. Whatever sounded commercial was grist to the mill; ‘Taking Care of Business’ itself was based on a radio jingle that one day got stuck in his head! Nevertheless the kids lapped it up. Despite Bachman’s opportunism, fans (especially in Canada) took to his music almost like a cause in itself. From the evidence available, it seems that Bruce Allen had always been intensely driven and ambitious – a character with a sharp eye on the entertainment business – and he was always ready with an opinion. In 1975, at the peak of BTO-mania, Allen accompanied the group on a 10 city, 13 date Canadian tour which netted them $1.5 million; a staggering figure for the time. The crucial thing about the BTO tour was that Allen learned about the real practice of pleasing crowds by observing his band; it was a kind of apprenticeship for him. The last half of the decade was a time of difficulty and great change for Allen. Although he took up Prism, after Bachman left BTO in 1977 the band fell apart, so Allen’s main act was no more. Also that year, Sam Feldman, who became strained from working with such an overpowering partner, left with his booking agency (which took $1 million annually in those days). He and Allen remained legally bound together so they could continue to share in each other’s profits. Despite these setbacks, Allen’s track record left him as the most important music industry figure in Vancouver. He had three vital ingredients to help any budding talent that he chose to take on: working capital, contacts within the industry, and an aggressive approach to shopping his clients to the major labels. Bryan Adams had been pestering Bruce Allen for a whole year before anything really happened. Absorbed in his existing business concerns, Allen just didn’t want to know. Eventually, in December 1979, the manager capitulated. He had already overseen Jim Vallance in Prism and he knew Vallance had talent. Furthermore, his new charge had predicted “I’ll be the biggest act you ever have” and Allen knew that he meant it. [iii] Bruce sent Bryan a contract laying down the standard 15% manager’s fee, but Adams never signed it; trust was enough. Adams’ publishing deal with A&M gave him immense freedom. It meant that a kid, still in his teens, was given the opportunity to express himself to a wider audience. That set the stage for Bryan Adams to spend his twenties literally growing up on record. In 1979, a year after his publishing contract began, Adams’ label lifted the song ‘Let Me Take You Dancing’ from a 4 track demo, remixed it, and sped it up at the label’s New York studios ready for release. The song became a minor disco hit, setting alight dance floors in Montreal, New York and Paris; eventually it sold around 240,000 copies, but it was a rather embarrassing beginning. Adams and Vallance steeped themselves in conventional pop and rock influences so they were not primarily orientated towards the disco market. Their squeaky platter became the dubious hook around which early tales of the emergence of Bryan Adams could be written. Yet, apart from the royalty cheques from A&M, even ‘Let Me Take You Dancing’ had an advantage: it meant that at only 19 years old, Bryan Adams had emerged as a vocalist in his own right. However, it was still several years before his success in that direction was to eclipse his role as a writer for other more famous artists. While Adams had underground disco success, his manager was more concerned with shaping up another act new to his books: Loverboy. Loverboy’s story started across the Rockies in Calgary where Lou Blair, who ran the Refinery Nightclub, took charge of a veteran guitarist named Paul Dean. Aged thirty three, Dean had been knocking about in Canadian bands for several years. In the 1960s he’d been part of the Vancouver-based outfit Kenny Dean and The Chantells, who were another of the bands bringing alive the North West’s R’n’B scene. More recently he had enjoyed success as the leader of Winnipeg’s finest hard rock group, Streetheart: a band which, amongst other things, cracked the US market with a cover of the Stones’ tune ‘Under My Thumb’. Blair spent time clearing Dean of outstanding legal contracts (a process known as ‘cleaning up’ in the business), after which he presented the musician to Allen in a bid to engineer a co-management arrangement. The two men struck up a deal which would work because, in general, Blair kept out of the way. Allen was left to construct a band that could respond well to salient market forces. He attempted to engineer their image in a way that would maximize profits in light of where he thought the industry was going and based on what he had learned from BTO. The strategy was to appeal to young girls, take full advantage of the emergent medium of video, and provide hard rock anthems for the masses. Dean was an old hand – Loverboy was his 14th band – so together with singer Mike Reno he chose the rest of the group’s members as much for their good looks as for their musical abilities. Allen told them how to dress (choosing bright reds and yellows), the order in which to play their songs at gigs, and he even tutored them on topic effective between-song patter. The band’s members initially called their alliance The Project, in deference to its money-making potential. Their whole approach to rock was a highly calculated pretence. After rejections from nearly two dozen record companies CBS decided to give Loverboy a try, so they recorded an album that the label released in Canada during 1980. As the experiment was successful, the album was unleashed on America the following year. Allen kept Loverboy particularly well regimented and was in the habit of paying his bands a salary while investing the rest of the money they made. In 1981 his band did 250 dates without any set changes; they stuck closely to the formula that they had hit upon. The next year Allen made a $1 million deal with Nissan Automobiles to sponsor their tour, which consisted of another 240 dates. Soon a string of hit singles, hit albums and a loyal fan base had secured fame and fortune for the boys. To organize his finances that year Dean alone employed 4 lawyers, 2 accountants and a bookkeeper! Allen had got his formula spot on target, Loverboy captured a loyal clutch of fans and the group became a huge success. Even their t-shirts were so lucrative that the group formed their own manufacturing company rather than take the usual option of a royalty cut from profits made by other operators. Loverboy had found the magic formula that let them coast on into the mid-1980s. Their albums were usually produced by Bruce Fairbairn in Vancouver’s Little Mountain Sound Studios, and their production sound was so good that other rockers sat up, took notice, and came from all over the USA. Those who could afford it arranged to record their own material at the studio, and gave Bob Rock (who began behind the console as a sound engineer) and Bruce Fairbairn a nice, steady income. The pair helped several top bands to capture a characteristic metal sound in the studio. Arguably the most important group they assisted was Bon Jovi, who recorded their breakthrough album ‘Slippery When Wet’ in Vancouver during 1983. The success of Little Mountain Sound meant that Bruce Allen came up trumps. As well as managing Loverboy, he represented Fairbairn and Rock. However, that emerging solo singer he had taken on, the one named Bryan Adams, was (relatively speaking) still in the shadows.